What Tory's budget choices, or lack thereof, say about what we might expect from his mayoralty. 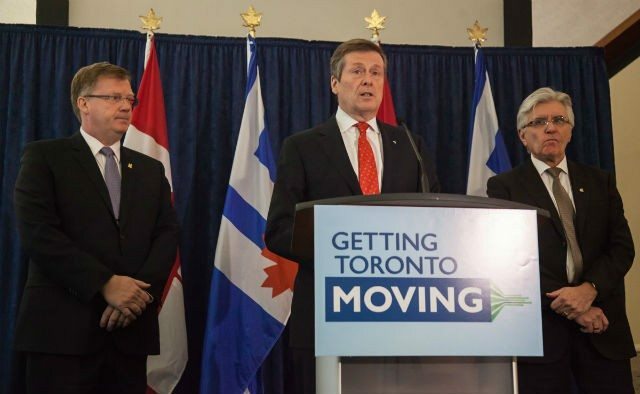 John Tory at the unveiling of the municipal budget on January 20, 2015. Mayor John Tory’s new budget is being praised as “aggressively moderate.” But let’s be clear: it’s only “moderate” in a world where the politics of Rob Ford are treated as a serious alternative. The mayor is being praised for his willingness to restore City services whose removal during the Ford years was actively harmful to Toronto’s citizenry. Toronto, though, deserves a better standard for its politics. With this budget, Tory made the ostensibly bold decision to restore services, while ensuring his base was affected as little as possible by the new spending necessary to bring those services back up to snuff. Yet another fare hike for transit users. (John Tory promised during his campaign that TTC fares would not be raised, but hard times call for hard sacrifices—for some Torontonians more than others.) Increases in user fees for City services such as parks permits and garbage bins. A property tax increase below the rate of inflation (excluding the mandatory Scarborough subway increase)—which effectively becomes a property tax cut, because property taxes do not rise with the economy as income or sales taxes do. It’s fair to say that these budgetary decisions affect Tory’s generally well-to-do voter base as minimally as possible. Of course, Tory’s proposals won’t be enough to resolve the City’s budgetary shortfall, and if you believed him during the election, this is where his supposed pull with the provincial and federal governments was going to come in handy: a major part of the mayor’s plan for budget issues involved “working with” upper levels of government to find more money in their coffers for Toronto. Naturally, every mayoral candidate said they wanted upper levels of government to give us more money—in part because nobody in their right mind is going to campaign for mayor of this city on a platform saying “We deserve less,” and in part because it’s just good sense. Toronto contributes and always has contributed far more in taxes to both provincial and federal governments than it receives, and even though urban centres are going to have to shoulder the expense of supporting rural communities to a certain extent in any large province, Toronto’s burden is frankly excessive. Instead, the Province of Ontario has extended a $200-million line of credit (re-payable with interest) that the City may use in order to meet its operating budget. Presently, the City expects to use around $85 million of that line of credit. This is one of the few times when the “You wouldn’t organize your family finances this way” argument about governmental budgeting is actually meritorious, because borrowing money to pay ongoing regular expenses is never an optimal choice (indeed, the province prohibits municipalities from doing so—this special arrangement is something of an end-run around those rules). In Toronto’s case, borrowing money rather than simply raising property taxes in one of the most property-undertaxed cities in Ontario is simply wildly irresponsible. John Tory has to know all of this. The entire point of John Tory’s campaign was that he would be a competent and responsible manager, which is why it is so amazing (if, to this publication, sadly unsurprising) to see him champion such an irresponsible move. We are simply borrowing money that will have to be collected in the form of taxes later in order to avoid paying taxes now. We aren’t even doing it for anything serious, such as a major capital expenditure; we’re doing it to pay for basic services, and we’re doing it simply because John Tory and his supporters in city council don’t want to raise property taxes—hoping that somehow the money will show up, or that, at the very least, they can avoid raising taxes long enough that this becomes the next guy’s problem. John Tory was supposed to be a sober fiscal steward. The municipal budget represented his first real opportunity to make a tough decision, take a tough fiscal stand. He could have decided that City services aren’t worth paying money for; we might sharply disagree with that, but cutting services is at least an honest choice. He could have decided that we all need to pony up for the services we want the City to have. Both of these options would have been unpopular with part of the electorate, but they would have been fiscally responsible. But Tory didn’t do either of those things; instead, he’s creating additional debt that the City simply did not need to take on—and doing so only to avoid making a difficult call. It’s a cowardly, weak decision, and bodes poorly for his mayoralty.